[ Royal Navy commission to 'Her Majestys Steam Ship the Simoom'. ] Appointing Lieutenant Peter Mackenzie Godfrey, on vellum and signed by Admirals Sir Alexander Milne and Lord FitzHardinge, and by First Secretary of the Admiralty John Parker. The Admiralty [ London ]. 10 February 1852. Printed on one side of a 28 x 34 cm piece of vellum, and completed by Parker in manuscript. With the customary tax stamp and embossed Admiralty seal. In good condition, with the customary aging and wear of the vellum. Headed 'By The Commission for executing the Office of Lord High Admiral of the United Kingdom of Great Britain and Ireland &c.' Godfrey's seniority is given as 30 August 1841, and the document is signed by 'J Parker', 'M. F. F. Berkeley' and 'Alexr Milne'. The word 'Commissioned' is written at the foot. [ Richard Chenevix Trench, Archbishop of Dublin and poet. ] Autograph Letter Signed ('Richd. C. Trench, [ to his publisher the London bookseller John W. Parker ] regarding his writing plans and engagements. 'Itchen Stoke'. 15 August 1840. 4pp., 12mo. In fair condition, lightly aged, with closed tears along the fold between the two leaves of the bifolium. Trench's publishers were 'John W. Parker & Son, West Strand'. The letter begins: 'I heartily wish that I could go to the press at once with the 3rd. Edition of the Parables. [ 'Notes on the Parables of Our Lord', first published in 1841 ] I have been however working hard at them & they are nearly ready. Remembering Henry Miller: A Collage. A Henry Miller Centenary Celebration. Script compiled and arranged by Francine Parker. October 26, 1991. Lenart Auditorium, Fowler Museum of Cultural History, UCLA. A program of UCLA Extension's Department of Humanities, Sciences, and Social Sciences. Jackson/Ashley A272. Unpublished. 43 pages in A4 (unpaginated title and pages 1-42). Perfect bound with black cloth spine in light-green wraps with title duplicated on front wrap. Very good, with top corner of front wrap slightly dogeared. With four photocopied A4 pages of typescript loosely inserted: the first carrying 'The Naked Tongue' by Diane Miller; the second 'Religious Views of Life'; the third, headed 'Remembering Henry Miller: A Collage', giving details of cast and crew; the fourth headed 'Celebrating Henry Miller: A Collage includes selections from the following:'. Scarce. [ Louis Napoleon Parker, dramatist and composer. ] Five Autograph Letters Signed (all 'Louis N. Parker') to 'Mrs. Whitley' of the Pall Mall Gazette, regarding her interviews of him, one jokingly giving the opinion of 'Percy- the cat'. Four on letterhead of 75 Gunterstone Road, West Kensington, W. [ London ], and the fifth from the same address. Between 15 June 1898 and 4 October 1899. A total of 6pp. (5pp. in 12mo and 1p. in 4to). The five items in fair condition, with light signs of age and wear. In the first letter, 15 June 1898, he says he is posting 'the MS. (untouched: it is excellent) to Sir Douglas' (i.e. Whitley's editor, Sir Douglas Straight). The following day he informs her that 'the interview reads charmingly', and that 'everybody in the theatre is delighted with it', adding that he has 'just posted it to the Poet'. [ Parker Gillmore ('Ubique'), Scottish author. ] Autograph Signature on card. Good firm signature, written diagonally across a 9 x 12 cm piece of grey card, the reverse of a printed advertisement for the American & Colonial Exchange, 8, The Haymarket, London, S.W. In good condition, lightly-aged, with minor traces of glue from mount on the printed side of the card. Seventeenth-Century Vellum Manuscript Indenture, Exemplification of a fine levied between Henry Parker and Edward Alfrey plaintiffs, and Walter Smyth and Mary his wife defendants, of messuages in Middlesex (St Clement Danes), Cornwall and Devon. Exemplification of 11 July 12 Charles II  of a fine levied in Hilary Term 16 Charles I [1640/1641]. On one side of a skin of vellum (roughly 42 x 58 cm). In fair condition, lightly aged and worn. Ruled with red lines, and with ornate initial capital and decorative pattern at head. In English. Signature cut away from gutter and tab removed. The document relates to eight messuages in the Parish of St Clement Danes, Middlesex; three messuages and lands in Penzance, Penryn, Madron, Gwendron, Mave, Gluvias, Scancrett and Grade, in Cornwall; and lands in Wilmston and Tavistock, Devon. Scan on application. [Early Victorian railways.] Seven items on the topic, including six Autograph Letters Signed by William Green, John Gregson, Jonathan Binns, Oswald Gilkes, Augustus Maitland, William Shuttleworth, to John Diston Powles, Sir Joseph Fowler and others. The six letters from London, Liverpool, Ulverston, Durham, Darlington, Edinburgh; written between 1824 and 1859; the transcription undated, but after 1821. Seven items, all in good condition, on lightly-aged paper. Housed in an elegant and sturdy custom-built brown buckram folder, with thick boards, flaps and red leather label, with 'Letters on Railways' stamped in gilt on the spine. The first item is a transcription of a set of accounts by Edward Pease, and the other six items are letters, whose authors are: William Green, John Gregson, Jonathan Binns, Oswald Gilkes, Augustus Maitland, William Shuttleworth. Autograph Note Signed to Rev. R. Best? ], concerning takings from his lectures. Old Trafford, 24 October 1866. One page, thirteen lines, 8vo, small closed tears, text clear and complete. "As I cannot continue my lectures on [? see scan], for some time to come I return a proportion of the balance of money collected in various towns. I have not taken one penny for my labours, but I propose to retain about one third of the balance [underlined] as there were innumerable etceteras about a work like mine. If any of the subscribers object to this, please let me know. - I enclose a cheque for £5." Best has listed 6 recipients of shares of this £5 on the verso of a conjoint leaf ,and with a small sum. Autograph Note Signed ('Gilbert Parker.') to 'Mr Anderson'. 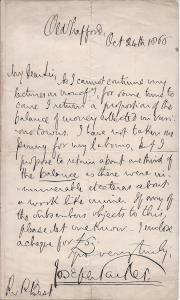 5 April 1922; on letterhead of 24 Portman Square, [London] W.1. 4to, 1 p. On aged, worn paper with small area of loss at head (not affecting text). He will be 'pleased to act on the Committee to judge of the stories for filming', and is glad that 'the work will not be onerous'. In a postscript gives the version of his name he wishes given for announcing ('Right Hon. Sir Gilbert Parker Bt.'). According to his entry in the Oxford DNB, no fewer than sixteen of Parker's novels were filmed. As head of British propaganda in America, 1914-1916, Parker had a direct involvement with the medium. Two Letters Signed, the first in a secretarial hand and the second in Autograph, to Rev. Joseph Lucas. 16 November 1827 and 7 March 1873; both on letterhead The Rosstrappe, Highbury New Park [London]. Both items one page, octavo, and on aged and creased paper. Regarding Lucas's selection from Parker's works, 'Detached links; extracts from the Writings and Discourses of Joseph Parker' (Richard D. Dickinson, 1873). LETTER ONE: Thanks Lucas for his 'kind note', but does not 'see how the suggestion it conveys can be realized. I am afraid you would find it difficult to get a publisher.' Advises Lucas 'not to pursue the idea any further'. LETTER TWO: In a shaky hand explains that he is 'so poorly just now that I cannot give any phot[ographe]r. a sitting. Autograph Letter Signed to 'Mr Stuart', together with manuscript of 'Open Church Declaration [...] written by Dr Joseph Parker at Ventnor | Sept 5 1889'. Non-conformist divine, theologian, preacher and miscellaneous writer (1830-1902). The letter: two pages (on first leaf of bifoliate), 12mo, very good though a little grubby. The declaration: one page, 12mo, creased and grubby. A line from the 'P' of Parker's florid signature on the letter extends horizontally across to the recto of the otherwise blank second leaf of the bifoliate, the verso of which is glued to a quarto leaf. The declaration is glued over the second leaf of the letter, partly obscuring the tip of the signature line. Autograph Letter Signed to 'Mr Gorton' of the Globe newspaper. 17 May 1832, '10 . o clock'. Oxford bookseller (c.1774-1850), described by the bibliographer Dibdin as 'the Corinthian pillar of Bibliopolism at Oxford'. Written in the year of his retirement in favour of his nephew John Henry Parker. The Globe was a London newspaper, founded in 1803. 1 page, 8vo. In good condition, slightly discoloured, creased and with some contemporary ink spotting. Remains of glue from stub along one edge. Concerns the radical meetings held during the passage of the Reform Bill. Reads 'Dear Sir - | Most important Meetings have taken place at Birmm.